FIBARO Swipe is a revolutionary battery gesture control pad that allows you to control devices in your Z-Wave network without actually touching anything. Swipe up, down, left, right, make a circular gesture and use sequences to get full and intuitive control of your home. Installed device perfectly matches your interior design, as it resembles a picture frame. You can even personalize it with your favourite picture. Gesture controlled menu allow to add/remove or reset the device without dismounting it. FIBARO Swipe is a Security Enabled Z-Wave Plus product and a Security Enabled Z-Wave Controller must be used in order to fully utilize the product. Place the Swipe within the direct range of your Z-Wave controller. Move and hold your hand close to the center of the pad. If the device is battery powered, high pitched beep will signal exiting the Standby Mode. Loud sound sequence will confirm entering the menu, keep holding your hand. After hearing two short beeps (green indicator colour), withdraw the hand and perform swiping up gesture to confirm selection (two beeps will confirm validity). Successful adding will be confirmed by the Z-Wave controller’s message and 3 short beeps (green visual indicator colour). If the device is battery powered, high pitched beep will signalize exiting from the Standby Mode before entering the menu. In case the device is not added, please reset the device and repeat the adding procedure. 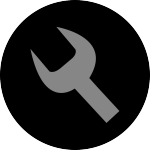 Removing the device from the Z-Wave network restores all of its default parameters. Successful removing will be confirmed by the Z-Wave controller’s message and sequence of 2 short beeps, pause, 1 short beep (red visual indicator colour). Choose 3rd menu position (3 short beeps). After few seconds the device will be restarted. Not being added to the Z-Wave network will be signalized with sequence of 2 short beeps, pause, 1 short beep (RED). There are two powering modes of the Swipe. By default, powering mode of the device is updated automatically (in intervals specified in parameter 5) after changing type of supply. The Swipe sends detected gestures to the Z-Wave network immediately, but configuration parameters and associations settings only at wake up (in time intervals or manually), independently of the powering mode. The device does not work as a Z-Wave repeater, even when connected to the external power supply. Battery powering mode – by default, the Swipe is supplied with 4 batteries included with the device (type AA 1.5V). They are not rechargeable and should be replaced after wearing out. The device in this mode uses power saving function to preserve battery life. External supply mode – the Swipe can be supplied with a 5V DC power supply connected to the micro-USB port. In this mode batteries will work as an emergency supply. When battery powered, the Swipe will enter Standby Mode by default (signalled with a low pitch beep) after 5 seconds of inactivity to reduce the battery usage. In Standby Mode range and frequency of detection are reduced preventing normal gesture detection. Operation of power saving mode can be modified in parameter 6. Move your hand close to the centre of the pad. Wait for the high pitch beep. Move your hand away from the pad. The device is ready to detect gestures. The Swipe needs to be woken up to receive information about the new configuration from the Z-Wave controller, like parameters and associations. Use 1st menu position to wake up the device or click the button on the back of the device once. To select current position, withdraw the hand and perform swiping up gesture to confirm selection (two beeps will confirm validity). If the device is battery powered, high pitch beep will signalize exiting from the Standby Mode before entering the menu. Menu can also be operated using the service button B. The Swipe is equipped with a buzzer and LED diode, signalling gesture detection, menu position and status of the device. Gestures are not indicated by the LED diode by default. In order to enable it, set the value of parameter 3 to 1. Every basic gesture and sequence has its own Scene ID that is send to the main controller after recognizing it. Scene activation for basic gestures is send after second gesture or timeout. Toggle Mode (parameter 12) disallows doubled gestures. The Swipe is equipped with a service B-button, which allows to use the menu. The B-button is located on back of the device and requires dismounting the Swipe from its back case. Make sure the device is powered via micro-USB port. User can create sequences of two or three gestures to expand number of possible actions. Every sequence is saved in its advanced parameter (no. 31-36) with 16 bits, every basic gesture is identified with 4 bits. Maximum of six sequences can be created. Each sequence must be unique. Sequence can consist of two or three basic gestures (left, right, up or down). Two identical gestures cannot be used next to each other. Change value of parameter 30 to number of sequence slot you want to fill (1 to 6). Wake up the device using 1st menu position (see “Operating the device” on page 10). The device will enter learning mode, which is signalled by constant beeping. Drag and drop two or three gestures to create a desired sequence. Confirm the selection by clicking “Confirm a new sequence”. Click the plus icon (“New Reaction”) next to the newly created sequence. Select the device you want to control. From the available options select the reaction of the controlled device and complete the setup by clicking “Save”. Change the value of corresponding parameter (parameters 31 to 36 for slots 1 to 6). 2nd association group – “Flick UP” is assigned to moving the hand up over the panel (sends Basic Set command frames). 3rd association group – “Flick DOWN” is assigned to moving the hand down over the panel (sends Basic Set command frames). 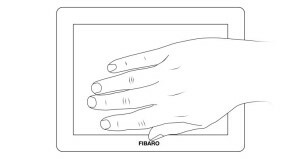 4th association group – “Flick LEFT” is assigned to moving the hand from the right to the left side of the panel (sends Basic Set command frames). 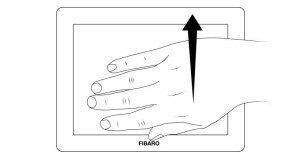 5th association group – “Flick RIGHT” is assigned to moving the hand from the left to the right side of the panel (sends Basic Set command frames) . 6th association group – “Circular AirWheel” is assigned to circular move of the hand clockwise or counter-clockwise over the panel (sends Switch Multilevel Start/Stop Level Change command frames). The Swipe in 2nd to 6th group allows to control 5 regular or multichannel devices per an association group, with the exception of “LifeLine” that is reserved solely for the controller and hence only 1 node can be assigned. By default 2nd-5th association groups are set to toggle mode - single gesture will reverse state of the association group (turns ON when it’s OFF, turns OFF when it’s ON). Can be modified via parameter 12. Wake up the device manually to speed up the configuration process (1st menu position). States of the association groups are affected only by assigned gestures. Changing state of associated device by other means will not update remembered state of association group. FIBARO Swipe allows to customize its operation to user’s needs. The settings are available in the FIBARO interface as simple options that may be chosen by selecting the appropriate box. The Swipe will wake up at each defined time interval and always try to connect with the main controller. After successful communication attempt, the device will update configuration parameters, associations and settings and then will go into Z-Wave communication standby. Setting wake up interval to 0 disables sending Wake Up notification to the controller automatically. Wake up may be still performed manually using 1st menu position. Parameter determines orientation of the Swipe in relation to its default position. Required for proper gestures recognition. Acoustic signalling of gestures detection. Active acoustic signals can be selected in parameter 4. Visual indication of gestures detection. Acoustic signalling of gesture recognition result (using the built-in buzzer). Parameter 4 is relevant only if parameter 2 is set to 1. This parameter determines how often the device checks if the USB power supply is connected and updates powering mode if needed. This parameter determines operation of gesture detection when battery powered. When Standby Mode is selected, hold gesture must be performed to exit power saving mode and reactivate normal gesture recognition. The device in Standby Mode consumes the least battery life. When Simple Mode mode is selected, gesture recognition is always active, but only slowly performed gestures will be recognized properly (high battery consumption). This parameter allows to choose if the menu can be entered using the Hold gesture. After disabling the Hold gesture in parameter 7, menu can be entered by using the B-button only! Defines which actions result in sending scenes to 1st “Lifeline” group. Parameter 10 values may be combined, e.g. 1+2=3 means that scenes for flick UP and DOWN are enabled. Parameter defines how commands are sent in specified association groups: as secure or non-secure. Parameter is active only in Z-Wave network security mode. It does not apply to 1st “Lifeline” association group. Parameter 11 values may be combined, e.g. 1+2=3 means that 2nd & 3rd group are sent as secure. Parameter allows to choose control mode for 2nd-5th groups and scenes. By default, Toggle Mode is active, meaning that a single flick turns ON the group and the same flick turns it OFF, doubled flicks are inactive. After disabling Toggle Mode a single flick will turn the device ON and the same flick doubled will turn it OFF. Parameter 12 values may be combined, e.g. 1+2=3 means that 2nd & 3rd group are selected. Disabling Toggle Mode will introduce delay when performing single gestures. Parameter allows to choose how long the hand has to be held near the center of the pad after “AirWheel” gesture for the associated devices to reach their maximum/minimum level. Commands sent to association group for turn ON/OFF can be adjusted in parameters 20-27. This parameter allows to set value sent in SWITCH ON command frame to the association group. This parameter allows to set value sent in SWITCH OFF command frame to the association group. Parameter activated by the main Z-Wave controller. Change its value to launch sequence learning procedure for the desired slot. Parameters 31-36 can be used to manually set a sequence. Value containing sequence of gestures. 1. How many devices can you control with one SWIPE? FIBARO SWIPE is a scene controller, each gesture can control multiple devices at the same time and when you trigger scenes the only limitation is number of devices used within a scene. 2. What gestures can be used? There are four (Up, Down, Left, Right) basic gestures. In addition you can enable circular gestures in parameter 10: circle right, circle left. You can also use 6 combinations of basic gestures. Max. 12 gestures and combinations can be used. 3. What type of material will SWIPE work through? SWIPE can work through any non-metallic material: wood, drywall, stone (granite, marble), also glass (single layer), laminate and any synthetic material. It will not work through metal or mirror. Thickness may vary depending of material type. 4. How close does your hand have to be in order for SWIPE to work? Max distance is about 5 cm (2”). 5. What size picture fits into the SWIPE? 10 x 15 cm (6 x 4 inches). 6. How is the SWIPE powered? 7. What do all the beeps mean? 8. What type of devices can you control? Any Z-wave device, virtual device or any device included in any kind of scene can be assigned to one of the gesture/combination. 9. How do you control Sonos if it’s not Z-wave? Sonos or any TCP/IP device can be controlled using Virtual Device buttons or scenes using available LUA commands. 10. How do you open a window with SWIPE? SWIPE can trigger Z-wave actuator or Z-wave relay connected to an actuator to open or close the window. 11. How do you control an alarm system? You can create a scene to arm/disarm alarm system and use a SWIPE to trigger it. Combination of 2 or 3 gestures can be used to trigger an alarm scene. 12. Can you increase volume with circle air pattern? Yes, you need to create a Lua scene to do so. 13. Is the SWIPE always on? SWIPE is always on when has micro-USB connected. 2) External power supply mode: constantly detects gestures. 14. How come sometimes I have to gesture twice to make device work? Device may be in battery powering mode and needs to be awaken before the gesture or first gesture wasn’t done close enough. 15. How long do the batteries last? It depends how often you are going to use the device. SWIPE’s battery life on default settings is like typical remote control. 16. How else can you power SWIPE? SWIPE can be powered using 4xAA batteries and/or micro-USB 5V. 17. What requirements must be met by sequences? 18. What is the best way to mount it behind/under material? Remove the front picture cover and use double sided tape or Velcro to attach the device to horizontal or vertical surface. Make sure surface you want to mount SWIPE is clean of dust or grease before you apply any type of mounting material. Do not overuse mounting material to make sure you can easily remove it without bending or breaking any SWIPE parts. 19. When SWIPE is placed behind material what are all the beeps? Beeps may indicate validation of gestures, menu, entering/exiting standby mode or any interference with metal materials like cables, metal re-bars, etc. 20. Can I turn the buzzer off? Buzzer may indicate successful or failed gesture recognition. You can decide which one you want to have signaled or disable the buzzer. 21. Will SWIPE work without the frame? SWIPE can be powered directly using micro-USB without using the frame.